Let me explain what's going on right now over here in this house. It. Is. SO. Quiet. I don't really know what to do. Ellie is at a little day camp and Grant is working and for the first time in months (literally) I am here, in this house, alone. I am sitting at my desk. Drinking some coffee and crossing some things off the to do list. It. Is. Glorious. I absolutely love it in here. 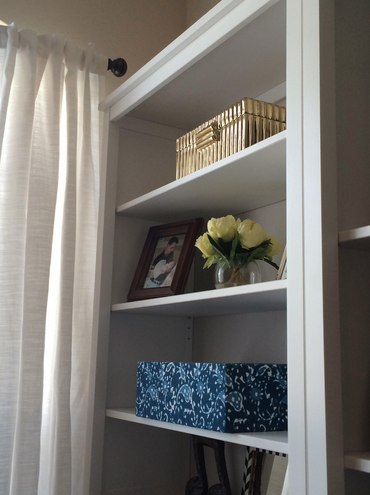 My friend and decorator, Liz, helped me kinda put all my ideas together into something wonderful. The rug is from HomeGoods, the chair is from a friend who was giving away a free chair, the drapes are from Target, the desk is from Ikea, and those are 4 bookshelves from Ikea pushed together to give the idea of built-ins. 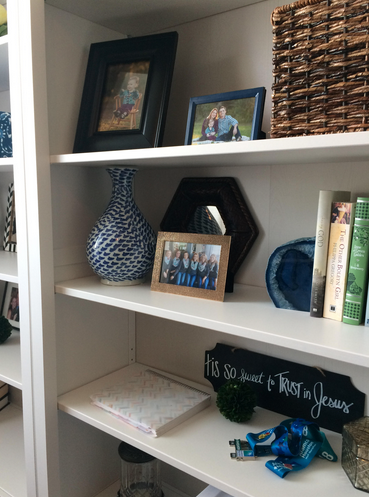 I filled the shelves with photos of my favorite things and people. In the above pic, the blue ribbon at the bottom is from the half-marathon I ran back in January. I keep it there to remind myself that there was that one time that I did something athletic. 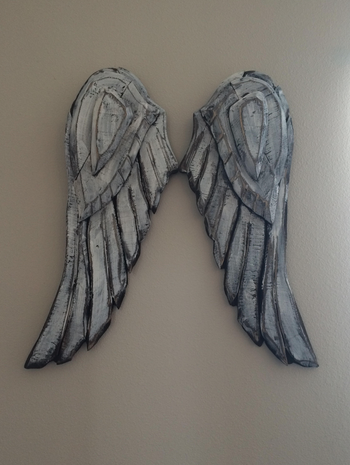 Also, on an opposite wall that you can't see from the desk picture, are these beautiful wooden angel wings my friend Liz found for me. I LOVE THEM. Aren't they so cool?! My mom and I kinda always had an angel thing when I was a little girl, so they remind me of her. Grant did not enjoy hanging them, but I really enjoy looking at them! Anyways, I love this room. 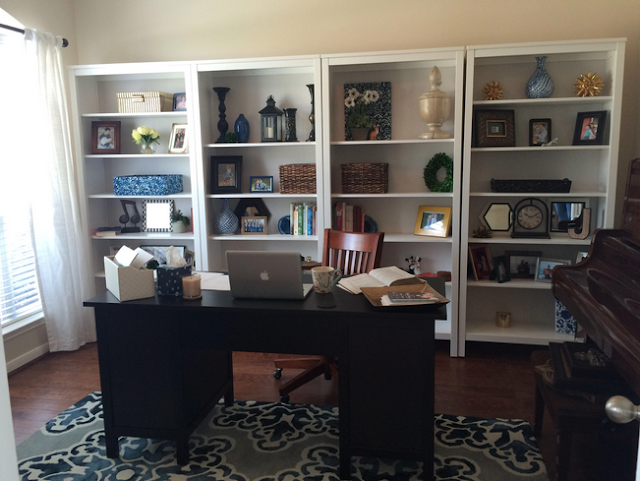 I do my Bible study in here in the mornings and I absolutely love writing in this room. My piano is in here too. I don't get to play much lately, but I love that one day I will teach my kiddos their first piano lesson right here in this room on the same piano that I learned to play on. Full circle, y'all. Okay, the fact is that I feel really weird amidst all this silence. I'm off to have a conversation with my dog.